Reading snow and terrain is an essential skill for every mountaineer, especially for backcountry skiers and snowboarders. Together with Pieps, the worldwide leading company in technology of manufacturing avalanche transceivers we have developed a fine tuned one day Avalanche Skills Training Workshop. You will learn about snow, stability tests, how to organize rescues, have intense training on Pieps ART station and more. Reading snow and terrain is an essential skill for every mountaineer, especially for backcountry skiers and snowboarders. 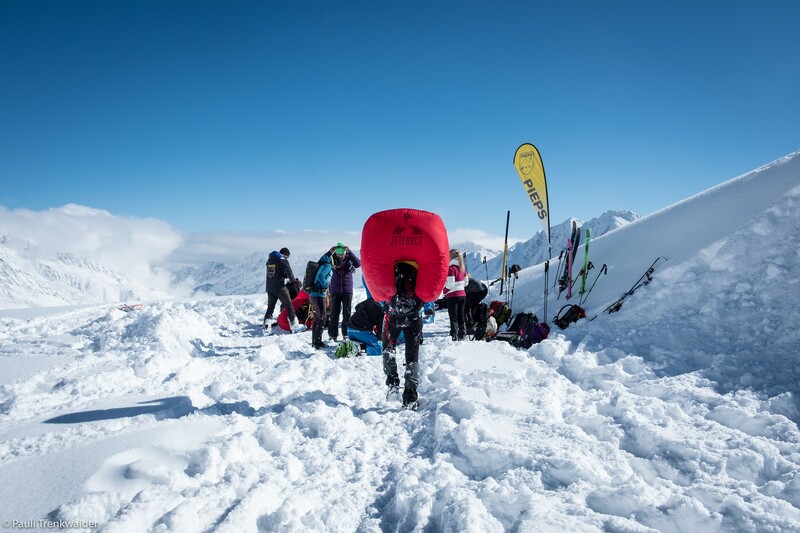 Together with Pieps, the worldwide leading company in the technology of manufacturing avalanche transceivers we have developed a fine-tuned one-day Avalanche Skills Training Workshop. You will learn about snow, stability tests, how to organize rescues, have intense training on Pieps ART station and more. The workshop is suitable for everyone who likes spending their winters in the mountains - skiing, snowboarding or hiking..
We can adapt to different levels of experience - beginner to expert, add the basic use of crampons, ice axe, rope skills, setting belay points, how to build improvised stretchers etc… Our program can also be a perfect team building activity on a highly professional level. Contact us for Teambuilding or group workshops and we will customize it depending on your wishes and number of participants! In the morning we will meet at Vogel resort where we have set up Pieps Art Station (multi-burial simulation polygon), a great tool for beacon training. The first hour and a half we will learn theory (slideshow indoor) about planning, snow, equipment, terrain reading, rescue protocols, getting to know the equipment. The rest of the day will be in the snow classroom (outside) learning about snow, stability tests, how to organize rescues, training on Pieps ART station. The practical part outside will be based on individual and team work. Always remember that snow is constantly changing and can surprise even the most experienced mountaineers and skiers. Take at least one day every season to renew your knowledge of snow safety with your friends or on an organized workshop! Exploring the magnificent valley of the Seven Triglav Lakes in the heart of the Kingdom of the Goldenhorn and climb to the top of mystical Mt.Triglav. There are loads of hidden places to see when you have some time to spare. If you want to get the most of your Triglav ascent, we highly recommend this program! “Iron road” makes climbing more accessible and takes you to amazing exposed places usually reserved just for mountain goats, climbers or alpinists. Variety of the routes and their difficulties makes this activity suitable for experienced mountaineers as well as families and beginners. True our courses you will learn how to use the equipment and safely enjoy climbing via ferrata routes on your own. If you enjoy the heights, amazing views and exposed places this via ferrata is just for you! You will see picturesque Mojstrana village, the great upper Sava Dolinka valley and the full Karavanke range. During the summer a late afternoon evening climb in the shade is much better than the morning activity, but in the spring and the fall you can enjoy and keep warm on the sun during the whole day. Variety of the routes and their difficulties makes this activity suitable for experienced mountaineers as well as families and beginners. Wild Alpine flowers growing next to the path will bring smiles to your faces and make this experience even more unforgettable!